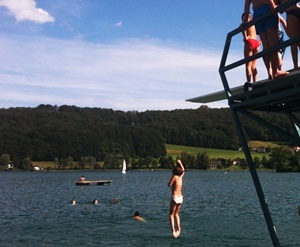 July in Austria – for children and teenagers that means summer holidays. School break in Austria means 9 weeks of long vacations. In the eastern part of Austria it will start on July 2nd and in the western provinces, among them Salzburg, summer vacations will start on July 9th. Vacations will end in September, in Vienna, Lower Austria and Burgenland this will September 3rd, youngsters in the rest of Austria will end on September 10th. In July Austrian kids have plenty of time and in Salzburg this means lakes, outdoor swimming pools and lidos and having fun with water. Especially in Salzburg we thick medieval stone walls and stone buildings which accumulate lots of heat during sunny days. Fortunately there are a lot of big and small lakes around Salzburg that give you some refreshment. Wallersee, Mattsee, Obertrumer See, Wolfgangsee, Fuschlsee and Zeller See are great lakes for swimming and there might even be a little cooling wind and big trees to provide some shade. If that does not help to relieve the heat of the summer, than do it like shown on the photo of our July calendar sheet - make a big leap into the water and have a long swim. Most lakes in Austria have rafts and maybe little islands you can swim to.